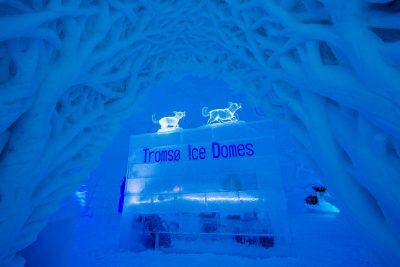 This fantastic short break combines the beautiful, historic and vibrant city of Tromso, with the stunning and remote Malangen Resort, set in natural surroundings away from city lights, optimising aurora watching potential. Malangen’s superb collection of stylish properties and a great selection of optional winter activities at both locations are a winning combination. Tromso sits 350km above the Arctic Circle and is the largest city in northern Norway. The city centre is an endearing mix of old and new from restored wooden houses to striking modern architecture, the distinctive Arctic Cathedral probably the most famous landmark. Located on the small island of Tromsoya, the city limits spread out onto the mainland, connected by bridge and tunnel. Combine the city with the remote Malangen Resort, which comprises a stylish hotel complete with chic and spacious rooms, reception area, restaurant and bar in the main hotel building, sea-view apartments just a few metres away and a selection of deluxe cabins either on the fjords edge or located higher up with great views overlooking the fjord, and a mountainside wilderness centre called Camp Nikka set just a short walk from the hotel, which is used to keep watch for the aurora around a campfire. With a good selection of optional activities such as a guided northern lights watch, snowmobiling, husky sledding, nordic skiing, snowshoe walk, Sami Storytelling and fat bike rental, a 3-course evening meal and the convenient transfers between Malangen and Tromso twice a day - this short break offers a fantastic experience to northern Norway and aurora sightings this far north in such a remote location are often spectacular. For a festive break, Christmas is a great time to visit Malangen and spend time with familiy and friends. We have also introduced a specific New Year package to Malangen Resort departing on 30th December for 4 nights with half board and a selection of activities included. Please refer to the separate package for more information. 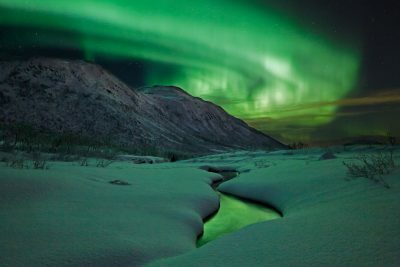 Direct flights operate from London Gatwick to Tromso 4 times per week (31 Oct - 30 Mar), departing on Monday, Wednesday, Friday and Saturday. Alternatively, there are regular flights from London Heathrow to Tromso via Oslo with Scandinavian Airlines. Fly to Tromso and make your way from the airport to the city centre by the regular airport Flybus service or by taxi (payable locally) for a 2 night stay in one of the central hotels on breakfast basis. Time to explore this small arctic city or join one of the optional winter activities. 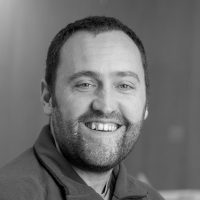 There are several places of interest to visit within walking distance as well as a good selection of hotels and restaurants. 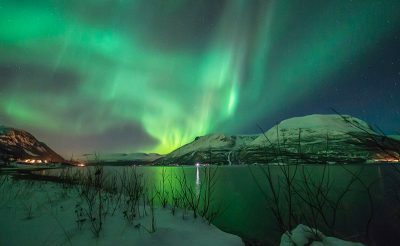 Another attraction is the number of opportunities to get out and explore Tromso's great outdoors, especially on northern lights safaris. The day at leisure before a transfer in the early evening at 18.20 from Tromso to Malangen Resort (journey time approx 90 minutes) with the stay based on a 3-course half board basis on both nights. Take time to check-in and enjoy the evening meal, getting acquainted with the surroundings. 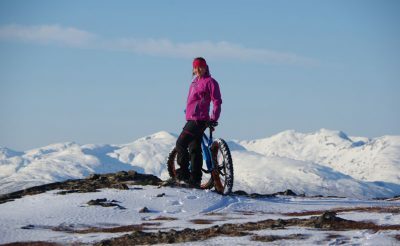 Enjoy the idyllic winter scenery or join one of the optional activities such as dog sledding, snowmobiling, snowshoeing, nordic skiing, sami storytelling and fat bike rental. Overnight at Malangen Resort. 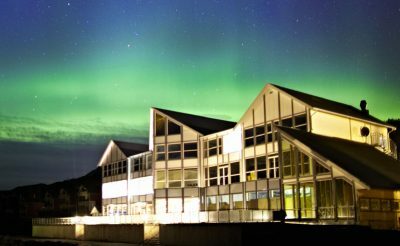 In the evening keep watch for the aurora or join the evening northern lights watch excursion to Camp Nikka, just 15 minutes walk away. Transfer back to Tromso Airport on the transfer shuttle, operating twice per day for your flight home or extend the stay further with extra nights in Malangen Resort or Tromso. The arranged transfers depart from Malangen at 09.00 & 16.15 hours to either the airport or city centre. The aurora resort of Malangen has beautiful fjord and mountain views and offers a choice of stylish accommodation in cabins, hotel rooms and apartments. 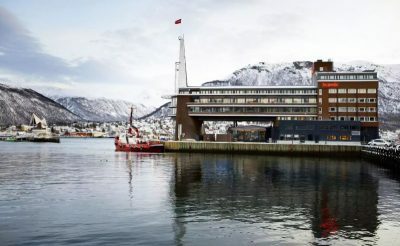 Centrally located in Norway's 'Paris of the North' of Tromso, this hotel offers 214 guestrooms on the city's quay, which stretches out over the Tromso strait and offers magnificent views of the harbour. 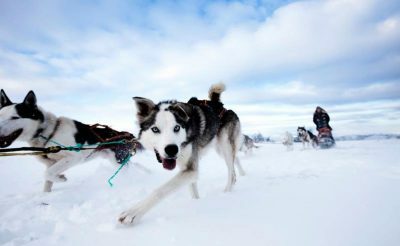 Mush your own team of huskies along snowy trails. 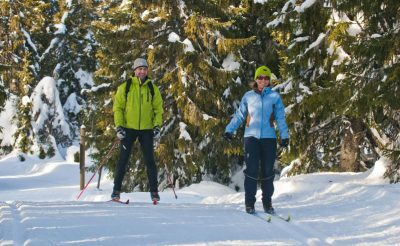 This excursion is great for those who are new to cross country skiing. 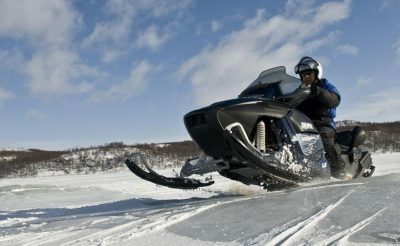 This thrill-seeking snowmobile excursion will take you from the fjords to the mountains and introduce you to some of the most incredible and beautiful scenery in Northern Norway. 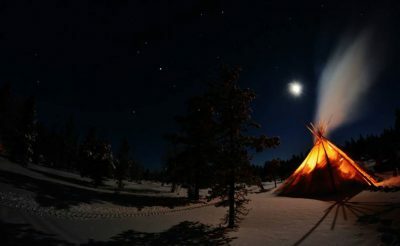 Visit Camp Nikka near Malangen Resort for a wonderful evening in search for the northern lights. Learn about the history, the culture and the old beliefs of the Sami people. 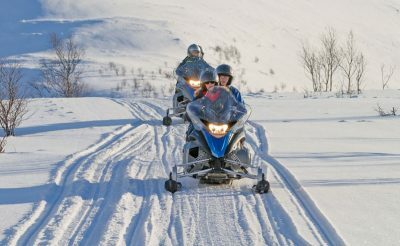 Transfer to the mountains before embarking on a thrilling snowmobile ride. Not nearly as complicated as they look, journeying out on a pair of cross-country skis is a great deal of fun. A scenic coach journey provided by Lyngsfjord Adventure takes you to the Arctic wilderness at Camp Tamok (transfer 75 minutes each way) – set among high mountains in the beautiful Tamok Valley. A scenic coach journey takes you to the Arctic wilderness at Camp Tamok – set among high mountains in the beautiful Tamok Valley. 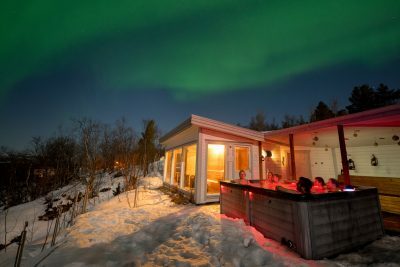 Sit back in the outside Jacuzzi looking out for the aurora overhead and then enjoy the panoramic view from the sauna. 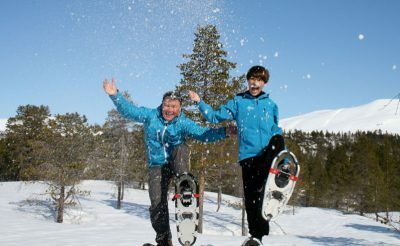 Learn the art of using snowshoes before embarking on a trek through the forests and across frozen lakes. 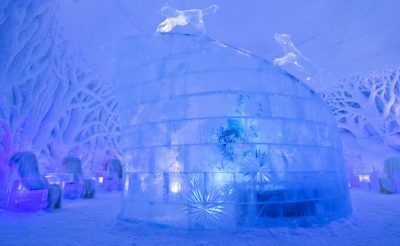 Visit the incredible Ice Domes situated in the Tamok valley and enjoy snowshoeing in the winter wilderness. Private transfers at other times can be arranged at a supplement.